TORONTO, ON / ACCESSWIRE / March 1, 2019 / Rupert Resources Ltd ("Rupert" or "the Company") is pleased to provide an exploration update for the Pahtavaara Project in the Central Lapland Greenstone Belt. Current activities are focused on adding to the 474koz Inferred resource at Pahtavaara from targets in Rupert's 290km2 contiguous land package in close proximity to the 1400tpd permitted mill and tailings facility at the property. James Withall, Chief Executive of Rupert Resources said "Our exploration efforts at the Pahtavaara Project continue to demonstrate the potential of the region. Further base of till (BoT) sampling gold anomalies have been identified near to the mine in the Arttu target area and at Area 1, a previously untested area in the south west of the licence that has been generated from our new detailed geophysics and regional geological interpretation. With three BoT rigs active and a ground gravity survey underway the team is excited about the potential to generate further BoT and diamond drilling targets over the coming months." Rupert has now completed approximately 2,400 points of the planned 8,500-point BoT programme that began in November and has three rigs active to accelerate the work both near to the mine, and over the extensive duplex structural zone that extends west from close to the Pahtavaara mine, to the western extent of the contiguous 290km2 land holding. Results have now been received for the remaining lines of the Arttu area sampled in January with two new gold anomalies identified (see Figure 1). The first area in the north east extent of sampling grid potentially extends the trend of anomalies that are aligned east-north-east from Paskamaa East up to 1.75km. The second area lies on the northern side of the Pahtavaara hill just 600m to the east of the mill facility in an area of shallow till cover where sample values up to 1.1ppm Au were recovered. Given the extents of both these new areas remain undefined, further extensions to the sampling grid and infill programmes are being planned and will begin when one of the rigs completes its programme in the western areas. All BoT rigs are currently working in the western area of Rupert's licences where the target areas of Area 1, Saitta and Koppelo are located (see Figure 2). Intially 3,922 holes are planned in this area with 750 completed to date. The first results from Area 1 have demonstrated gold anomalism and sulphide mineralisation that broadly aligns with key structures identified from the regional geological interpretation undertaken in 2018. Two samples containing anomalous gold of up to 0.6ppm Au were identified in the western most sampling traverse, close to the inferred contact of the Savokoski Group mafic and ultramafic rocks and younger Kumpu Group quartzites. The duplex structural corridor over which the BoT program is being carried out extends some 25km from the Möykkelmä intrusion, just north of Rupert's Pahtavaara mine, west-south-west, through the known Koppelokangas anomaly, to the Kutovuoma property (a joint venture between Aurion Resources and B2 Gold). Kutovuoma was previously operated as a satellite pit to Rupert's Pahtavaara mill. Rupert undertook a mapping and sampling programme in Area 1 during the summer of 2018 to follow up the detailed UAV magnetic survey which was used to develop the revised regional structural interpretation. This is the first time this licence area has been tested extensively using geochemical methods and over the coming months we expect to significantly advance the geological understanding of this prospective area. Rupert is also well advanced with its 2019 ground gravity survey and new data is currently being processed. 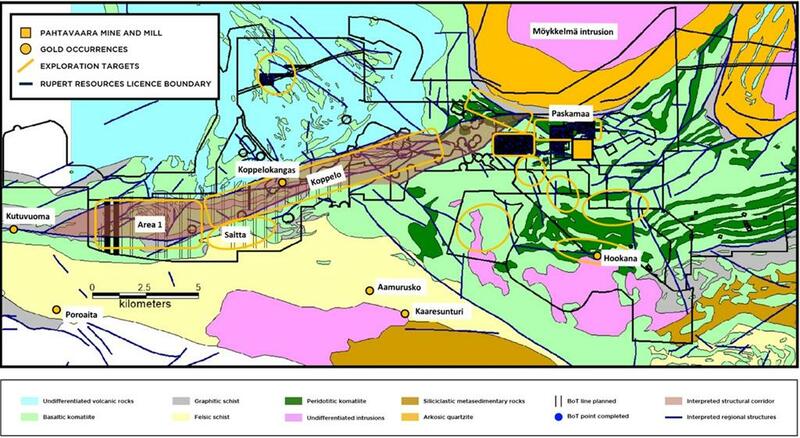 The gravity survey is intended to identify previously unrecognised intrusives and structural features that may act as a control on mineralisation at the Pahtavaara Project. The completion of this work in the next two months will also contribute to the company's base metals targeting strategy in the areas where we have VTEM geophysics completed by the previous property owners. This press release contains statements which, other than statements of historical fact constitute "forward-looking statements'' within the meaning of applicable securities laws, including statements with respect to: results of exploration activities, mineral resources. The words "may", "would", "could", "will", "intend", "plan", "anticipate", "believe", "estimate", "expect" and similar expressions, as they relate to the Company, are intended to identify such forward-looking statements. Investors are cautioned that forward-looking statements are based on the opinions, assumptions and estimates of management considered reasonable at the date the statements are made, and are inherently subject to a variety of risks and uncertainties and other known and unknown factors that could cause actual events or results to differ materially from those projected in the forward-looking statements. These factors include the general risks of the mining industry, as well as those risk factors discussed or referred to in the Company's annual Management's Discussion and Analysis for the year ended February 28, 2018 available at www.sedar.com. Should one or more of these risks or uncertainties materialize, or should assumptions underlying the forward-looking statements prove incorrect, actual results may vary materially from those described herein as intended, planned, anticipated, believed, estimated or expected. Although the Company has attempted to identify important factors that could cause actual actions, events or results to differ materially from those described in forward-looking information, there may be other factors that cause actions, events or results not to be as anticipated, estimated or intended. There can be no assurance that such information will prove to be accurate as actual results and future events could differ materially from those anticipated in such statements. The Company does not intend, and does not assume any obligation, to update these forward-looking statements except as otherwise required by applicable law.